Sorry, just to clarify: when you complete the hobby do you get a villa for free or do you still have to pay even if you complete it on the time limit? 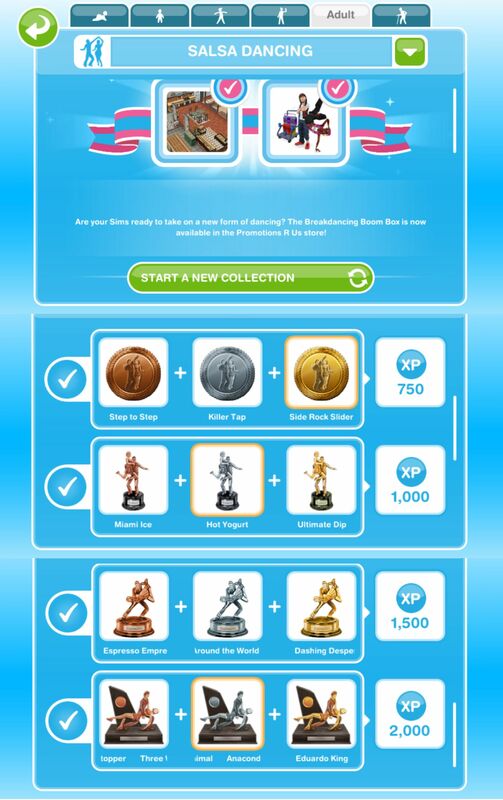 Also, to complete the hobby do you just have to level up to the highest level or do you have to collect the 12 item things? Btw, I love your blog so much – it has helped me so many times! So thank you haha! You get the first one free. You have to complete the hobby (find all the collectibles) like all hobbies. What happens if you complete the salsa hobby but don’t unlock the breakdancing boom box ? Has this happened to anyone? 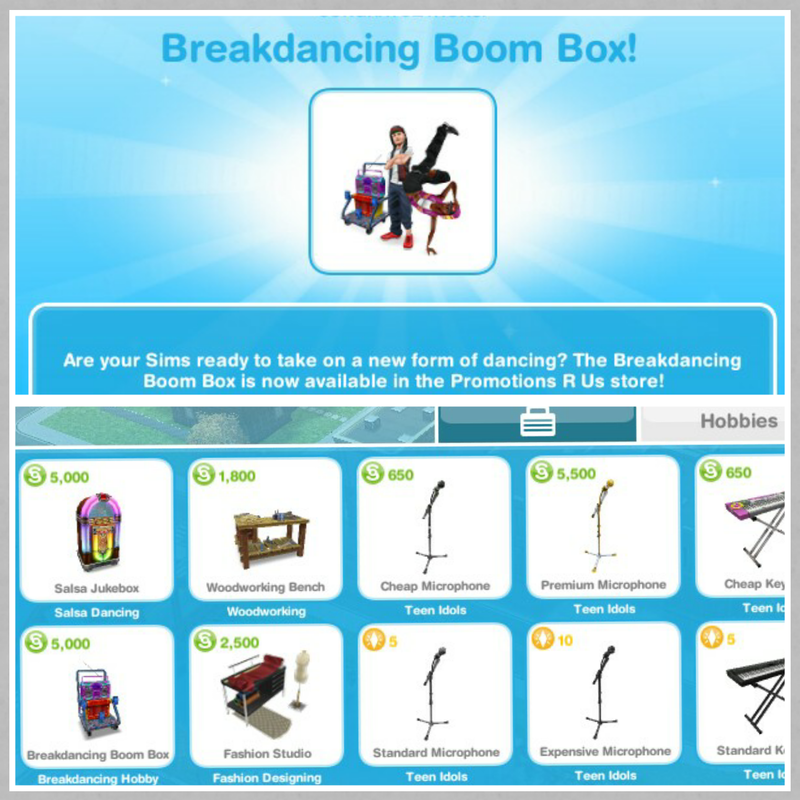 Is there another way to get the boom box? I forgot to put this in my last post, sorry! But do you still get the brea dancing hobby if you don’t complete it in the time limit? Yes, you need to complete the salsa dancing hobby first though, even if you don’t finish it in the time limit. How do you get the collectibles for the salsa event??? Just keep salsa dancing until you get them, you need two sims to complete this hobby. Any tips on how to make the additional content download faster ? Because it’s been stuck on 2.75 for a week. Please answer. You will need to contact EA to see if they can fix this issue for you. Can I complete the Salsa Dancing Hobby by doing “Quick Salsa” over and over again, or do I have to do the long 7 1/2 hour “Extended Mamba” to get like the more rare trophies? You can do the shorter option but you will probably want to do the longer option to level up first so you can unlock all the collectibles. I can’t complete the salsa dance in time. Do I still get the villa? Is it possible to tell what trophy you will receive during the dance? 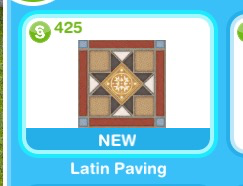 The Latin villa expired with 2 days on the clock, is there a way to resolve this? Has anyone else had this problem? There is a problem with timed events and hobbies at the moment so contact EA about this and they should be able to help you out. I started the hobby and I had 4 more days until the time ran out for the Latin villa. A bit later I when on the game and I said the villa had crumbled! I don’t know what to do. Contact EA about this issue as it is a common glitch in the game at the moment and they will be able to sort something out for you. Not sure if this question has been asked, sorry if it has, but can I use a neighbor’s jukebox? If so, will I get the collectables if I just “wait for dancing parnter”, or can this hobby only be completed in my own town? Thank you for your help! I worship your posts! No you won’t be able to do that because you need that second sim to start the dance to be able to complete the hobby. I’m sorry if this question has already been asked. Just wanted to know, is there any benefit of cheering your sims while they are dancing? Will this increase my level faster? My Salsa Sims cannot get the LAST TROPHY! They’ve been at it for days. He leads, she leads, quick salsa, long salsa, it doesn’t matter. How do I get the last trophy? All you can do is just keep going, there aren’t any tricks to it- some of them just take forever to find! I would suggest you stick with the shortest option to try and find it quicker. You could use the lucky spin on this but that will cost you LPs. Help, where can i buy the jukebox? i cant find it anywhere and im at the salsa dancing event quest. It is in the promotions r us store, it tells you that in the post. I hope you’re not tired of being thanked for a brilliant and helpful site because here comes another thank you 😉 I’ve been playing for quite some time now and have finished pretty much all quest within the time limit. 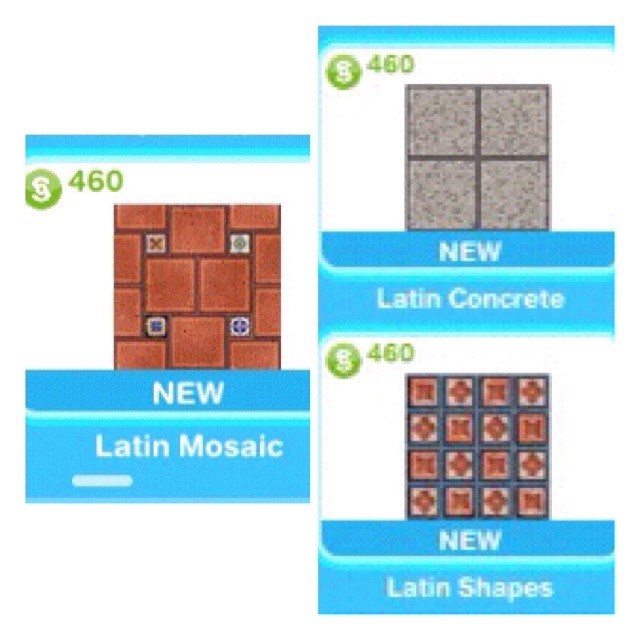 Only I failed to complete the salsa dancing quest so I missed out on the latin villa. 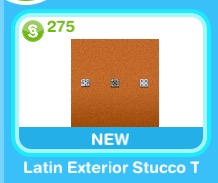 Do such quests ever return or do I simply have to accept that I cannot get the latin villa template? You didn’t unlock the villa? Hi, I bought the jukebox and when I’m about to place it in a house it says limited item and i cant drag the jukebox. I need help, anyone? You will get this issue if you are in the new items tab, if you go to the hobby and career items tab of your inventory you should be able to place the juxebox. Hey, I just wanted to know if I should do quik salsa or extended mambo ? And what if I switch partners ? I mean new sims. 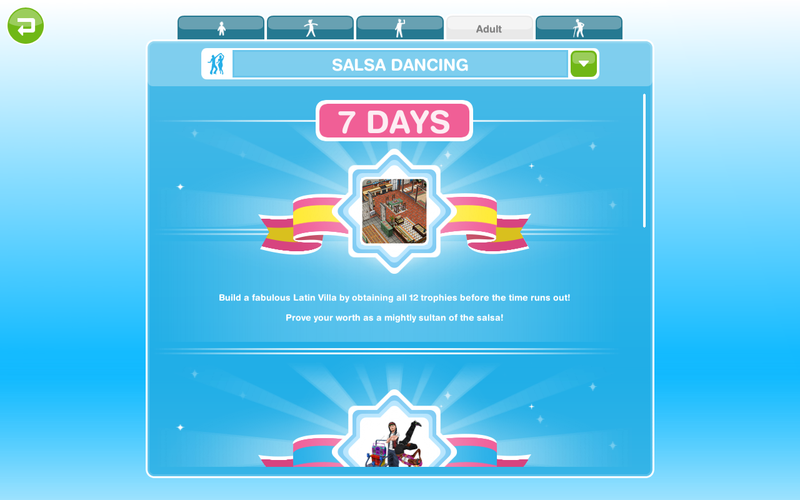 You should do extended mambo to level up to level 6 and then do the quick salsa once you reach level 6 to earn all the trophies as quickly as possible. 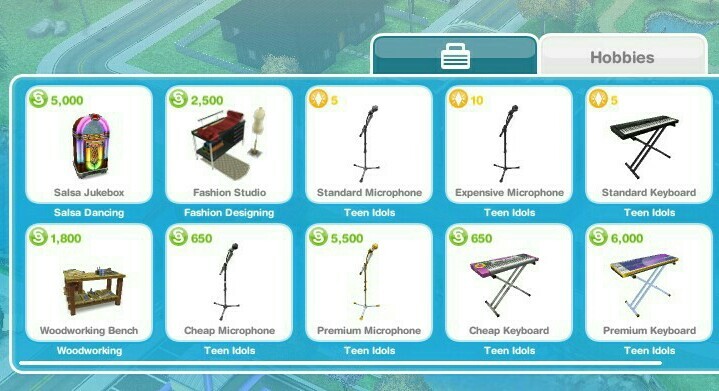 If you switch to two completely new sims then you will have to level them up again so wait until you reach level 6 before you change their hobby otherwise you will waste time trying to reach level 6 with the new pair. I passed the dance to remember quest, but i bought the jukebox on the promotions r us store, but i cant put it anywhere, it says there is one already?! where is it i cant seem to find it, i cant go back to villa what do i do?? Have you placed the jukebox in a house yet? If you have you will need to go to each house until you find it. If not you need to look in your inventory under hobby and career items to be able to place it, if you try and place it from new items it will say its locked or a limited item. Thank you, you beautiful human! i have been looking for the answers on how to start this Salsa hobby and no one could tell me! Thank you! Same here… THANKS!! you have become my number one reference for any question I got in the game, I just come to you page and have all the info I need plus tips… really appreciate you taking the time to give us a hand! Is the quest for the Latin Villa a discorvery task? Can I start it whenever I want? As soon as I finish a Dance To Remember, I’m starting A Bump-y Ride.